Cutis laxa is a rare disorder characterized by degenerative changes in elastic fibres. Congenital cutis laxa is more common than acquired cutis laxa. The recessively inherited form is severe and more frequent. Cutis laxa affects all races and both the sexes equally. 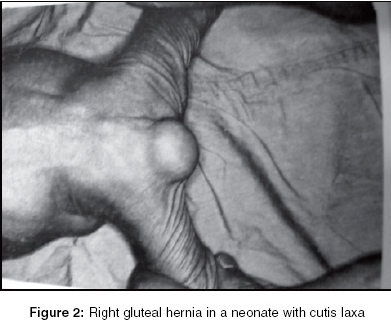 We report the first ever case of cutis laxa associated with multiple hernias and cardiac anomaly in an infant. Congenital cutis laxa is a rare, systemic connective tissue disorder marked with skin laxity. Congenital cutis laxa is more common than acquired cutis laxa. The recessively inherited form is severe and more frequent. The internal organs are frequently involved due to fragmented and disorganized (defective) elastic fibre formation. Clinical presentation and mode of inheritance show considerable heterogeneity. Inherited forms have shown the following patterns - autosomal dominant, autosomal recessive and x-linked recessive. The acquired form is less severe and associated with preceding inflammatory eruptions in 50% cases. A 1-month-old full term normally delivered neonate was referred with complaints of respiratory distress of one-week duration. Other complaints were cough, mild fever and laxity of skin. Physical examination revealed tachypnoea, laxity of the skin [Figure - 1] and right gluteal hernia [Figure - 2]. Haemogram, arterial blood gas and electrolytes were normal. X-ray chest and abdomen showed presence of abdominal contents in the left hemi-thorax in continuation with the abdomen. 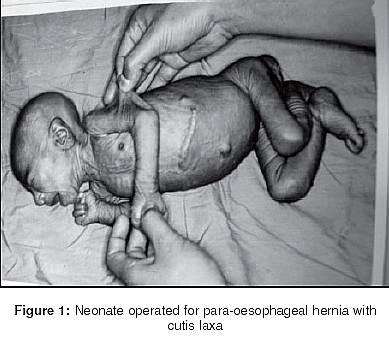 Ultrasonography showed left-sided congenital diaphragmatic hernia with no other visceral abnormalities (thoracic and abdominal-including genitourinary). Echocardiography done for clinically suspected murmur demonstrated the presence of a 1 cm sized ventricular septal defect (VSD). Operative findings revealed an intact diaphragm with a huge para-oesophageal hernia containing stomach, colon and small bowel. The gap of the oesophageal hiatus was 2 cm. After baring the oesophagus, the crura were opposed and the hiatus tightened with non-absorbable interrupted suture material. Feeds were started on the 7th postoperative day. The patient was discharged on the 12th day. The patient was advised to follow-up for repair of right gluteal hernia and VSD. Preoperatively diagnosed reducible and uncomplicated gluteal hernia was approached through the transgluteal route. 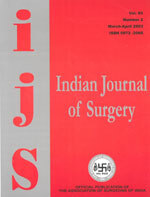 In the prone position, an incision extending from the hernia towards the greater trochanter was taken. The fibres of the gluteus maximus were spread to expose the piriformis muscle, sciatic nerve and gluteal neurovascular bundle. A few lax strands were present as piriformis muscle. The sac was reduced after confirming presence of small bowel in it. As the defect was more than 2 cm in size and the muscles were very lax, a prosthetic patch of prolene mesh was used to close the defect between the piriformis muscle and the iliac bone. The gluteal maximus muscle was opposed and the wound closed primarily. Postoperatively the patient recovered uneventfully. The patient is in regular follow-up. He is to be operated for VSD at the age of 5 years. Cutis laxa is due to abnormal elastin metabolism resulting in decreased dermal elastin component. It may be associated with growth retardation, psychomotor retardation, gastrointestinal diverticulas, genitourinary abnormalities, multiple malformative syndromes with facial dysmorphism, diaphragmatic hernia, emphysema, orthopaedic problems and cardiovascular abnormalities. Autosomal dominant forms have less complications with a normal life expectancy. The X-linked recessive form has skin laxity, skeletal and genitourinary tract abnormalities, being identical to the Ehler-Danlos Type 1X syndrome. Both the conditions are now known as "Occipital horn syndrome". The autosomal dominant form has a later onset than the recessive form. Acquired cutis laxa may develop at any age but often begins in adulthood. Clinically, the skin is free (most prominent around the eyes, face, neck, shoulders and thighs) and inelastic. It is not associated with poor wound healing. Histology shows reduction in the number of elastic fibres throughout the dermis, with the remaining fibres being shortened, clumped, granular, or fragmented. Severe cases show no elastic fibres but only fine dust-like particles scattered throughout the dermis. Involved visceral organs show granular changes in the elastic fibres similar to those seen in the skin. Electron microscopic examination reveals degenerative changes in the elastic fibres with irregularly distributed dense amorphous or granular aggregates. There is no treatment to prevent disease progression but Dapsone can be used to actually control swelling. The other underlying diseases to be ruled out are Costello syndrome, granulomatous slack skin, Marfan syndrome and mid-dermal elastolysis.